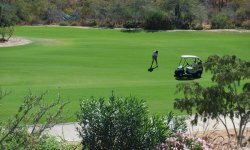 Cabo Real Golf Club was first opened for play in December 1994. This extraordinary golf course, designed by Robert Trent Jones Jr., immediately gained worldwide recognition upon opening. 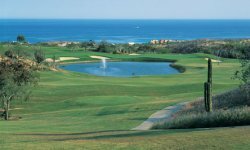 The championship golf course is highlighted by its three spectacular ocean front holes. The dramatic natural beauty of these holes were captured at its best during the 1996 PGA Senior Grand Slam, when television fans around the world were treated to an amazing performance by whales who were breaching just yards away from these amazing holes. Designer: Jack Nicklaus. Description: Palmilla Golf Club is Jack Nicklaus’ first Latin America design and is recognized as the Grand Dame of golf in Los Cabos. 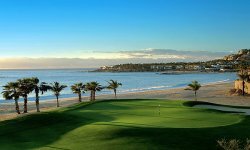 Challenging, masterfully-conceived and stunningly beautiful, Palmilla has ocean views from every hole.The Ocean Course actually flows to the ocean as you play on the beaches of the Sea of Cortez. This 27-hole course is perched on deep canyon arroyos and sits among century old cardon cacti. The initial offering will be our Composite Course, which consists of 9 holes from the Mission Course, designed by Greg Norman, and 9 holes from the Marina Course, designed by Jack Nicklaus. The Golf Club at Puerto Los Cabos will consist of 36 holes of exceptional championship golf, designed by two of the biggest names in golf: Jack Nicklaus and Greg Norman. The Jack Nicklaus Signature Course, which will be the Resort course, is certain to rank as one of Los Cabos' best public courses. The Greg Norman Signature Course will be the Private course, reserved solely for the homeowners of the community.